Party like its the last night of 2018! 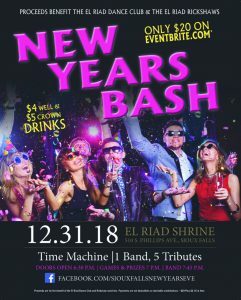 Live Music on New Year’s Eve at the El Riad Shrine. Don’t miss out on the high-energy, party tribute band, Time Machine! Complete with costumes, production and seasoned musicians, a Time Machine show is a must for those that want to party like it’s the last night of 2018! Doors open at 6:30 pm, games and prizes begin at 7:00 pm and Time Machine takes the stage at 7:45 pm. With Time Machine, you will experience 5 genres of music in one night! Time Machine’s performance includes: “Classic/Current Country” (Whiskey River), “70’s Pop/Funk/Disco (Night Fever), 80’s Pop (Pop Starz) and music from the top “80’s Hair Bands” (Hair Force). This is a New Year’s Eve party that you won’t want to miss! Must be 21 years old.